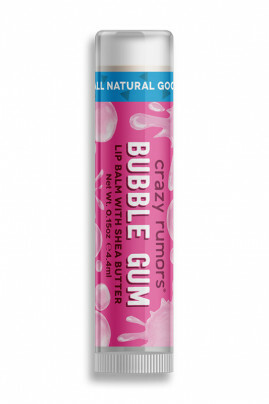 CRAZY RUMORS Natural Lipbalm Bubble Gum gives you a delicious and yummy sensation ! Its formula rich in organic shea butter nourrishes and protects your lips, they are smooth and delicately fragranced. Crazy Rumors Lip Balms are 100% natural, cruelty-free (not tested on animals) and vegan (no animal-derived ingredient). Discover their complete range of more than 40 different flavours ! Certified Organic Extra Virgin Olive Oil, Macadamia Seed Oil, Certified Organic Shea Butter, Candelilla Wax, Soy Wax, Jojoba Oil, Carnauba Wax, Natural & Organic Flavors and/or Pure Essential Oils, Vitamin E, Rosemary Leaf Extract, Natural Stevia. Hydratant et très gourmand il sent le malabars à la fraise ;) tout en restant naturel ! C'est un must have !